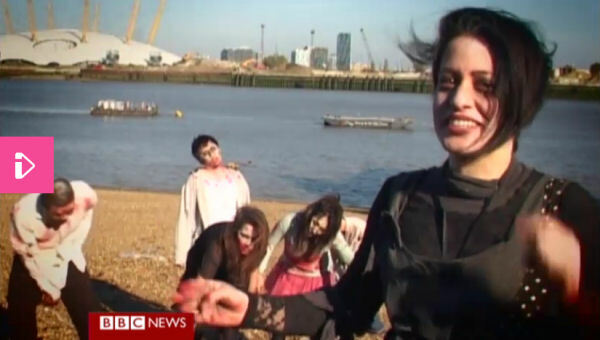 This weekend, Zombies Ate My City appeared on BBC Click, the BBC’s flagship technology show. The show aired on BBC News and BBC Worldwide and Zombies was part of a feature on transmedia storytelling. On the show was some behind the scenes footage from our film shoot back in October, along with a sneak peek at how the game development is coming along with some footage from one of our early tests in the city of Bristol. If you missed it, catch up on BBC iPlayer. If you’re outside the UK, or the link has expired, check out the YouTube video below of the feature. Anybody interested in how storytelling has been changed by computers, phones and tablets will enjoy the piece. Thanks again to the BBC Click team for coming down. They dressed up for the occasion and feature in a couple of the Zombie transitional spots within the game. You can see their starring roles when Zombies is released VERY soon!